Warner Street where Frank Tunaley (b.1852) was living at No.35 in 1881. 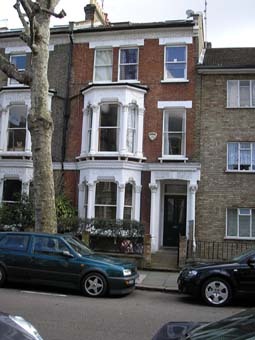 No.32 Swinburne Street where Sarah Tunaley (b.1832) was living with her sister Elizabeth Carney in1901. These photos show Royal Oak House (the half-timered building) which is now Derby Registry Office. It was originally a pub and is one of a number of properties listed in the wills of Thomas Tunaley (b.1772) and Henry Tunaley (b.1800). The photograph on the left is taken from Tenant Street where Thomas was living in 1841. A picture of Shaftesbury Street which is now an industrial estate. In 1901 Henry Tunaley (b.1869) was living at No.82 and his daughter Hilda Tunaley (b.1882) was living at No.72. Oxford Street which now forms part of the main entrance to the Derbyshire Royal Infirmary. The one remaining house is the corner shop shown on the right (with street sign). In 1901 Edward Tunaley (b.1844) lived at No.55 and John Tunaley (b.1873) lived at No.54. In 1881 Edward's father Samuel (b.1812) was living at No.55 with his daughter Jane Antill and her husband William. Samuel is the Great Great Grandfather of Phil Tunaley who took these photographs. The houses on Oxford Street are probably some of the five left to Samuel in his brother Henry's will. The next two photographs were sent to me by Jean Parkinson whose Great Grand Aunt Charlotte Dorothea Kembal married Robert James Tunaley in 1828. The wedding took place in West Stow in Suffolk. 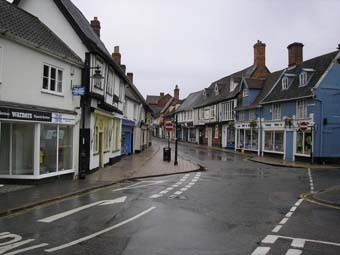 This is Market Street in Wymondham where Robert and Charlotte were living in 1841. This is No.23 Cromwell Grove in Shepherds Bush, London. Charlotte was living here in 1881 with her daughter Ellen Constantia Louisa Tunaley and Ellen's husband Theodore Drew. Jean's Great Grandparents William Hempson Denham and Harriet Elizabeth Kemball later lived in the same house.